When he was in the 7th grade and taking Saturday courses on aerodynamics at Northwestern University, Jonny Cohen noticed school buses’ inefficient design and was alarmed by the amount of exhaust they generated. He suddenly got an idea on how to make them more efficient, in order to slow carbon emissions, increase gas mileage and help schools save money on fuel. He create a prototype for a transparent Plexiglas cover to retrofit school buses by redirecting the airflow and reducing drag. Together with his older sister and other friend, he started the GreenShields Project to further develop his idea. 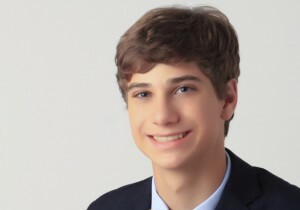 His team entered the 2009 Youth Venture Summit at MIT at MIT, where it won a $1,ooo grant. Jonny used the prize to “built a homemade wind tunnel and did testing in my garage, and then won a $25,000 grant” from the Pepsi Refresh project to test a full-scale version of his idea on school buses. After winning that prize, Jonny was invited on Good Morning America to discuss GreenShields. The Cook-Illinois Bus Corporation’s wife happened to be watching the program and determined her husband to offer the young entrepreneur a school bus to work on. Jonny also started working with Northwestern University’s Segal Design Institute, where he and his team developing a radically different that his original model, which was heavy, big and difficult to install. The new prototype, which is placed on top of the roof of the school bus, weighs only 8 lbs, costs only $30, and installs in minutes, reducing material and installation costs. Tests conducted with the school buses provided Cook-Illinois Corp. determined that the GreenShield improves fuel economy 10 to 20 percent, thus saving over $600 per bus per year of the over $6,500 that schools currently spend on diesel fuel for each bus. Jonny is in the process of obtaining permits from the Environmental Protection Agency and the Department of Transportation, in order to be able to bring shields for the mass market. GreenShields already has its first customer lined up, as the owner of the Cook-Ilinois Bus Company, Mr. John Benish, has promised to buy GreenShields for his 4300 bus fleet as soon as they will be on the market. Jonny believes that his mission will be over only when school buses “become super-efficient.” In recognition of his creativity, Jonny has been selected on Forbes “30 Under 30” list twice and has spoken at the 2012 Continuity Forum on the topic of future social, environmental and economic innovation. Among other prizes, the young entrepreneur’s project has also won the audience choice award from the Ashoka Youth Venture and Consumer Bankers Association Foundation’s “Banking on Youth” program.